AWT Expo 2016 Have You Registered? - Peabody Engineering & Supply, Inc.
AWT Expo 2016 Have You Registered? It’s only a couple of months away – have you registered yet for the AWT Expo 2016? 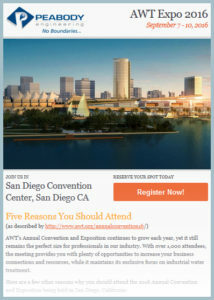 Click image below to read our newsletter about 5 reasons why you should attend and how to register. This year it is going to be in San Diega, CA and make sure you put us on your “Must See” list our booth is #501.